Hosting an Event is One of the Greatest Ways to Get People Excited and Talking About Your Business. Of course, it’s one thing to start planning and another to make sure people understand the value of it and actually show up! This is where event marketing with video is very effective… It’s no wonder that video platforms have taken off, with higher viewing rates and increased exposure, video marketing is the easy choice for inviting guests, promoting and ensuring a high attendance rate for your next event. Benefits to Using VidCorp as Your Video Platform For Marketing Events. Build hype, easily guage interest, and invest in easy data analytics for your events campaigns. Videos are automatic eye-catchers: People are immediately engaged, interested, and grabs their attention more than written words. Receiving a video invite, rather than a simple card, is going to be more personal, be noticed and appreciated, and potential attendees will be more inclined to share videos socially. Boosts Interactivity at the Event Itself. Interest and excitement are two of the key factors that motivate people to enjoy all the event has to offer. Video marketing creates a buzz that spreads as quickly as a video can be socially shared. You are already getting the conversation started before they enter the function and that is pure marketing gold. Video invites and other rich media messages are retained longer because multiple senses are involved. The higher retention rates make events more enduring and appeal to curiosity of what will come next. There is also higher memory rates associated with video, meaning they will be talking about your event for months to come! When tech-savvy event marketing is done well, your company and/or is viewed as a leader in new technology and cutting edge ideas. Videos and Video marketing is the up and coming new form of online marketing, and with VidCorp’s easy to use platform, creating professional and cutting-edge landing pages is easy. Landing pages can easily be branded and personalised. Events are made simple with the all in one direct marketing database distribution channels. 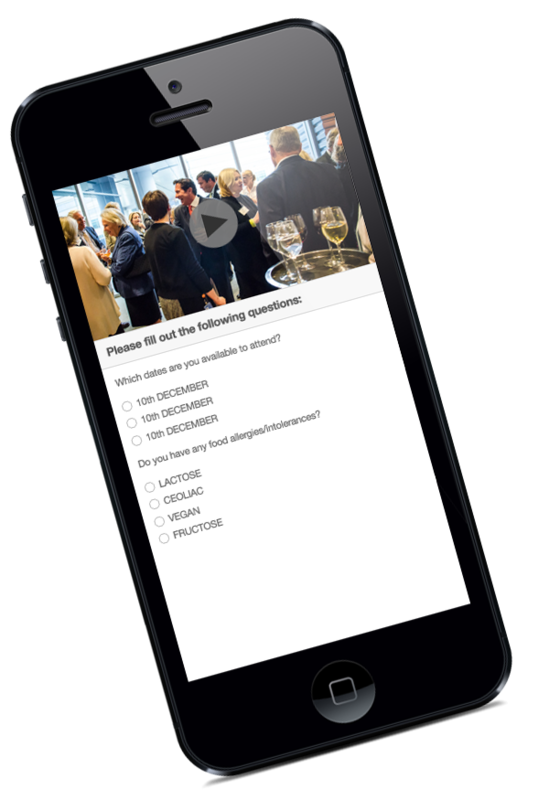 Ability to create forms for personal detail input, event/ food preferences, ideas, or even feedback in each and every video invite. Lead up to the event – create excitement, promotional videos, and social media event marketing as well as video invites and reminders. During the event – send videos of what’s going on/ what they may have missed at the event. Post-event – gain feedback on how people viewed the event and how you can improve in the future, promote your products or services, send a personalised video thank you, give consumers a reminder of product launches. Video competitions—Event marketing with video provides you with an amazing amount of promotional opportunities during, post, or even before! You can build hype or finish off your event on a high. How-to Videos – Whenever we head to events, we have tons of questions – where do we park? How do we get there? What should we expect? Video enables all these questions to be answered easily! Using video to market your next event is the future of successful planning and driving attendance rates. With VidCorp, our platform will help you each step of the way, ensuring your next event is a success.